This study aimed to determine CD4+, CD8+ T cells, CD4/CD8, CD4+ 25+ cells, and regulatory T cells (CD4+ CD25+ Fox P3+) in children with immune thrombocytopenic purpura (ITP). 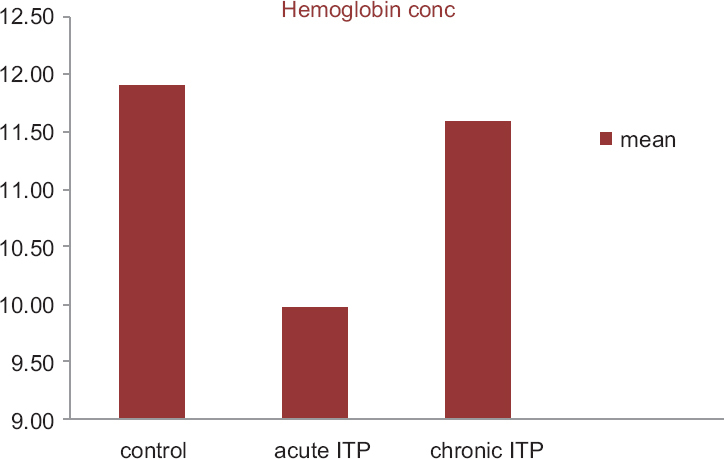 ITP is an immune-mediated hemorrhagic condition characterized by the production of autoantibodies against platelet antigens. Primary immune thrombocytopenia is characterized by isolated thrombocytopenia with normal bone marrow or increased bone marrow megakaryocytes; if this condition persists for more than 12 months, it is known as chronic immune thrombocytopenia. Regulatory T cells play a major role in controlling immune homeostasis and preventing autoimmunity. Immune thrombocytopenic patients show decreased numbers of CD4+ CD25+ FoxP3+ regulatory T cells. The study included 45 children: 15 children with acute ITP, 15 children with chronic ITP, and 15 controls. Three microliters of venous blood samples were obtained. A complete blood count was performed first. Flow cytometric analysis of lymphocytes was carried out to detect CD3+, CD8+, CD4+, CD4+ 25+ cells, and regulatory T cells (CD4+ CD25+ FoxP3+). No significant difference was recorded between the three groups in CD4+, CD8+, CD4+ 25+ cells, or the CD4/CD8 ratio. A significantly lower percentage of regulatory T cells was found in chronic patients in comparison with the controls (P = 0.00) and a significantly lower percentage of regulatory T cells was found in chronic patients in comparison with acute patients (P = 0.00), but no significant difference was recorded between acute patients and control (P > 0.05) in regulatory T cells. The present study showed that regulatory T cells are significantly lower in chronic immune thrombocytopenic patients, indicating its role in the pathogenesis of ITP. Immune thrombocytopenic purpura (ITP) is an acquired autoimmune thrombocytopenic syndrome characterized by immune-mediated platelet destruction because of binding of immunoglobulin (Ig) G autoantibodies to GpIIb/IIIa or GPIb/IX platelet glycoproteins ,. Primary ITP is characterized by isolated thrombocytopenia (platelet count <100 × 103/mm 3) in the absence of other causes or disorders that may be associated with thrombocytopenia . ITP affects approximately one in 25 000 children every year; ∼75% of patients recover spontaneously within 4–6 months. However, ∼20% of children newly diagnosed with ITP progress to a chronic form, defined as persistent thrombocytopenia (platelet count <100 × 109/l) for more than 12 months ,. The presence of autoreactive B cells producing autoantibodies against platelets has been considered the hallmark of the disease; defective cellular immune response has also been known to contribute in the pathophysiology of ITP . The cellular immune responses of patients with ITP have the characteristic hallmarks of breakdown in their tolerance mechanisms . T helper cells and the cytokines they produce play a key role in this breakdown . The abnormal helper T cells have been suggested to direct autoreactive B cells to secrete autoantibodies . In addition to the involvement of helper T cells in the pathogenesis of ITP, abnormal CD8+ cells' responses involving cytotoxic T-cell-mediated lysis of autologous platelets in patients with active ITP have been reported . Such abnormal lymphocyte responses in T and B-cell compartments as well as the reported cytokine imbalance in patients with ITP suggest potential defects in regulatory immune networks . An additional mechanism for peripheral tolerance is active suppression by a functionally distinct subpopulation of CD4 T cells called regulatory T cells (Tregs) . Regulatory T cells play an important role in the maintenance of peripheral tolerance and are characterized by the expression of the CD25 surface marker and the transcription factor forkhead box protein 3 (Foxp3), making up 5–10% of the normal CD4 T-cell population . Several regulatory mechanisms by Tregs have been introduced in which both direct cell–cell contacts as well as the production of soluble cytokines have been highlighted . For example, interleukin (IL)-10 is a regulatory cytokine involved in immune tolerance and IL-10-secreting Treg cells are considered an additional mechanism responsible for peripheral tolerance ,. TGF was found to be an important inhibitor of B-cell proliferation and autoantibody production . It also suppresses some Th1-mediated and Th2 cell-mediated autoimmune disease . In this respect, several studies have found significantly decreased Treg percentages in adults and children with ITP ,. The present study was conducted at the Clinical Pathology Department, Faculty of Medicine, Menoufia University during the period from August 2014 to November 2015. This study was carried out on 45 children: 15 children with acute ITP, 15 children with chronic ITP, and 15 healthy children as controls. Consent for participation in the study was obtained from each child's parents and this study was carried out under the approval of the Human Ethics Committee of Faculty of Medicine, Menoufia University. All patients were subjected to a full assessment of history with a focus on disease duration, drug intake, preceding viral infection, and bleeding manifestations. A thorough clinical examination was performed excluding organomegaly and lymphadenopathy. A full blood picture was performed. Sets of tubes were adjusted to every patient and control participant; 5 μl of CD3 PE monoclonal antibody (BD Biosciences, Franklin Lakes, New Jersey, USA) +5 μl of CD4 FITC monoclonal antibody (BD Biosciences) were added in the first tube, 5 μl of CD3 PE monoclonal antibody +5 μl of CD8 FITC monoclonal antibody (BD Biosciences) were added in the second tube, 5 μl isotype control (Ig) (BD Biosciences) was added in the third tube, and tube four was blank and considered a negative control. Then, 100 μl of peripheral blood was added to all tubes [after adjusting the total leukocyte count (TLC) to 10 000/mm 3], the tubes were vortexed gently, and incubated for 30 min in the dark at room temperature (18°–25°C). Cells were subjected to red blood cell lysis by 2 ml of lysing solution for 3 min. Then, centrifugation was performed at 300g for 5 min and the supernatant was removed. The cells were washed three times with PBS. Five microlitres of CD25 FITC monoclonal antibody (BD Biosciences)+5 μl of CD 4 PercP (BD Biosciences) were added to 100 μl of blood, and then the tubes were vortexed gently and incubated for 15 min in the dark at room temperature (18°–25°C). Cells were subjected to red blood cell lysis by 2 ml of lysing solution for 3 min. Then, centrifugation was performed at 300g for 5 min and the supernatant was removed. The cells were washed three times with PBS, then fixed with 100 μl of Cell Fix 1× (Beckman Coulter, Villepinte, France) and kept at 4°C in the dark for 15 min . Then, the cells were washed three times with PBS. Five microlitres of FoxP3 PE monoclonal antibody (BD Biosciences) and 100 μl of perm B2× (Beckman Coulter) were added to the same tubes incubated for 15 min in the dark at room temperature (18°–25°C). The cells were washed three times with PBS. Gating was performed on CD4, followed by analysis of coexpression of CD25 and FoxP3 (Treg cell) [Figure 1] and [Figure 2]. 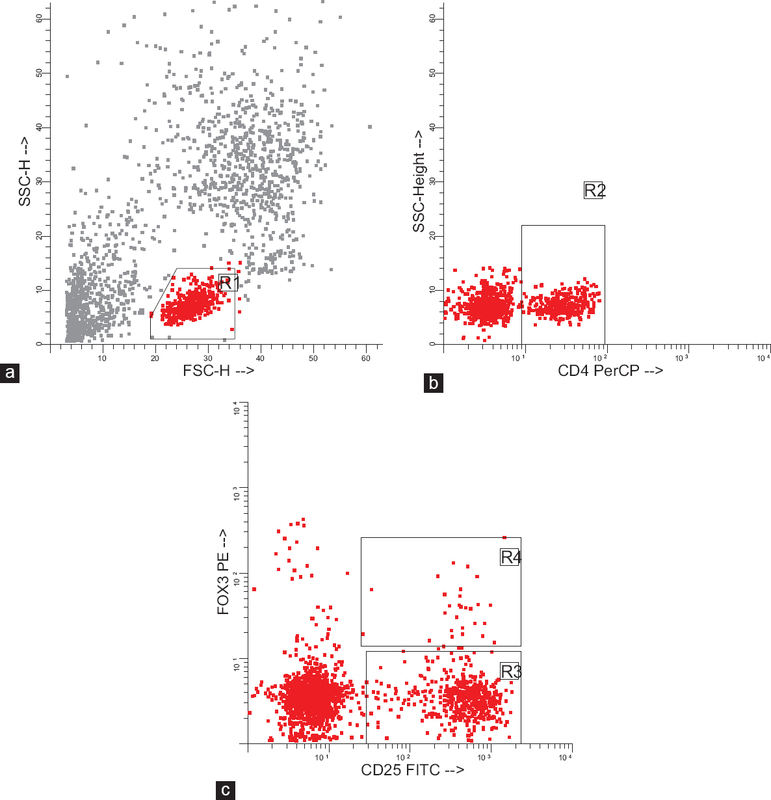 Figure 1: Flow cytometric analysis of CD3, CD4 and CD8 positive cells. (a) FSC/SSC analysis of peripheral blood gates around lymphocytes population (R1). (b) Analysis of lymphocytes population (R1) as regard to CD3 PE and CD4 FITC. (c) analysis of lymphocytes population (R1) as regard to CD3 PE and CD8 FITC. 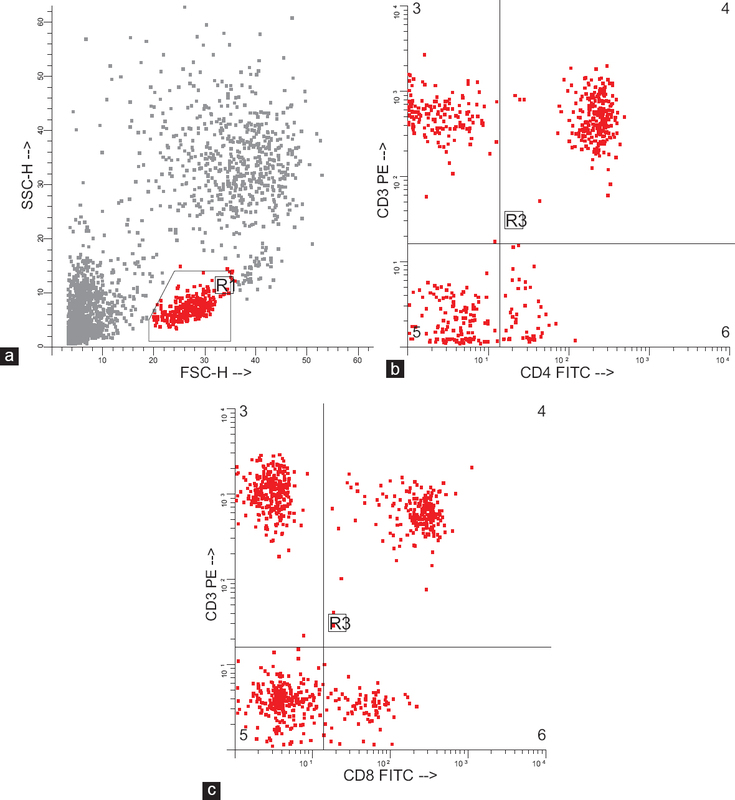 Figure 2: Flow cytometric analysis of CD4, CD25 and FOX3 positive cells (Treg. cells). (a) FSC/SSC analysis of peripheral blood gates around lymphocytes population (R1). (b) analysis of lymphocytes population (R1) as regard to CD4 PerCP positive cells (R2). (c) analysis of CD4 PerCP positive cells (R2) as regard to CD25 FITC & FOX3 PE (R3) represent CD4+CD25+ cells and (R4) represent CD4+CD25+FOX3+. Statistical analysis of the present study was carried out using SPSS V.20 (SPSS Inc, Chicago, Illinois, USA). Data were divided into two phases: a descriptive and an analytical study; the t-test, the Mann–Whitney test, the Wilcoxon signed-rank test, and one-way analysis of variance were used. A P value more than 0.05 was considered statistically nonsignificant. A P value less than 0.05 was considered statistically significant. A P value less than 0.001 was considered highly statistically significant. The results of the present study are shown in [Table 1] and [Table 2]. Figure 3: Hemoglobin concentration in participants in mean (no = 45). Figure 4: Platelet count in participants in mean (no = 45). 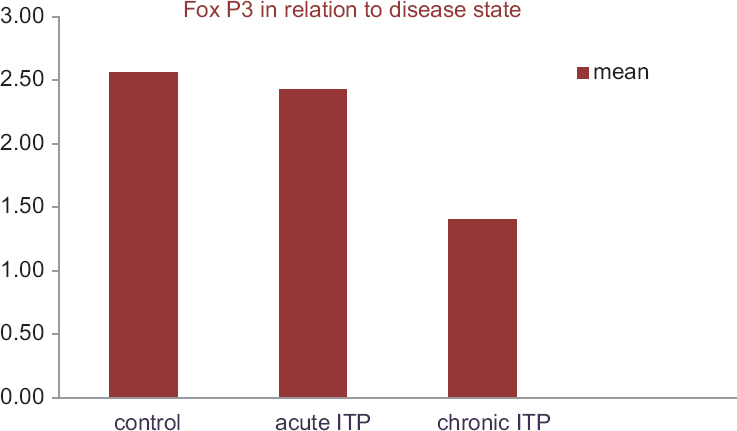 Figure 5: FoxP3 and disease state in participants in mean (no = 45). This work was carried out to investigate the change in the immunological picture in ITP patients with both acute and chronic forms. In terms of Hb, the results of our study were in agreement with those of Fahim and Monir , who reported that the mean Hb concentration was significantly lower in acute ITP patients in comparison with controls, but Zahran et al. reported that there was no significant difference in the Hb concentration between acute ITP patients and controls. In terms of the platelet count, our results were in agreement with those of Baraka et al. 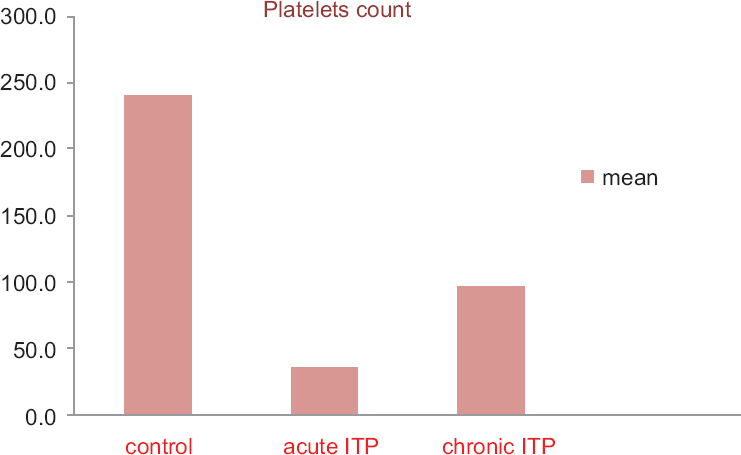 , who reported a significant decrease in the platelet count in acute ITP patients in comparison with controls. Also, Talaat et al. reported a significant reduction in the platelet count between ITP patients (acute and chronic) in comparison with controls. Edslev et al. also reported a significant decrease in the platelet count 'in acute and chronic stages', with a maximum reduction in acute patients. In terms of the TLCs, our results were in agreement with those of Baraka et al. , who reported no statistically significant difference between acute ITP patients and control in terms of TLCs. Also, Zahran et al. reported no statistically significant difference between acute ITP patients and controls in TLCs. However, Fahim and Monir  found that the TLC count was significantly higher in acute ITP patients than in controls; this may have been because of neutrophilia or lymphocytosis that may accompany the disease. In terms of the CD4/CD8 ratio, our results were not in agreement with those of Zahran et al. , who reported a significant statistical difference in CD4/CD8 between patients with acute ITP and controls (increased CD8 and decreased CD4). Talaat et al. reported excessive Th with almost the same level of Tc cells. These different results may be because of the fact that cytotoxic CD8+ cells are increased in patients with acute ITP as a response to viral infection as some cases had febrile illness, followed by immune thrombocytopenia, which has been attributed to the production of platelets expressing viral antigen, but in patients with prolonged duration, other immunological factors of thrombocytopenia such as elevated titers of antiplatelet antibodies may be responsible for the pathogenesis as in the Zahran et al. 's  study. CD8+ cells were significantly increased in patients with thrombocytopenia for a brief duration (<3 months) than in those with thrombocytopenia for a prolonged duration (>3 months); also, all cases in our study did not have a previous viral infection. In terms of CD4+ CD25+ cells, our results were in agreement with those of Zahran et al. , who reported that the percentage of CD4+ CD25+ cells was not significantly different between patients with acute ITP and controls, probably because CD4+ CD25+ HighFoxP3+ are considered regulatory T cells, as the suppressive capacity of regulatory T cells in humans seems to be confined to CD4+ CD25+ cells with the highest expression of CD25, whereas CD4+ T cell with an intermediate expression of CD25 might contain recently activated T cells and effector T cells without a regulatory function. In terms of Tregs, our results were in agreement with those of Baraka et al., , Zahran et al. , and Talaat et al. , who reported that the frequency of Treg cells in chronic ITP patients appeared to have decreased in comparison with controls. Mazzuco et al. also reported that there was no significant difference in Treg cells between the acute ITP patients and the control group. However, Zahran et al. , Baraka et al. , and Talaat et al. reported a significant reduction in the percentage of Tregs in acute ITP patients compared with controls. These different results may be because of the different phenotypes for Tregs according to investigators, the difficulty of methodology standardization, and the small accessible amount of Tregs, which makes the study more difficult; also, some studies reported a qualitative rather than a quantitative reduction of Treg cells in ITP patients as some of the previous studies used some other techniques such as enzyme-linked immunosorbent assay 'to detect ILs, for example, interferon-γ, tumor necrosis factor-α, IL-4, IL-6, IL-10, IL-12' and the PCR technique to detect transforming growth factor β1 and reported a significant decrease in Treg-inhibitory mediators of B-cell proliferation and production of autoantibodies such as transforming growth factor β1. The results of our study showed that the percentage of Treg was significantly decreased in chronic ITP patients in comparison with the controls and also in comparison with acute ITP patients. Thus, Tregs may play a role in modifying immune responses in these patients, and may enable the development of new strategies of treatment and monitoring of disease activity. McMillan R. Chronic idiopathic thrombocytopenic purpura. N Engl J Med 1981; 304:1135–1147. Malinowska I, Obitko-Płudowska A, Buescher ES, Wasik M, Rokicka-Milewska R. Release of cytokines and soluble cytokine receptors after intravenous anti-D treatment in children with chronic thrombocytopenic purpura. Hematol J 2001; 2:242–249. Ragab SM, Helwa MA, Khalaf AEA. Steroid-induced renal dysfunctions in children with immune thrombocytopenia. Menoufia Med J 2015; 28:986–990. Provan D, Stasi R, Newland AC, Blanchette VS, Bolton-Maggs P, Bussel JB. International consensus report on the investigation and management of primary immune thrombocytopenia. Blood 2010; 115:168–186. Josefowicz SZ, Lu LF, Rudensky AY. Regulatory T cells: mechanisms of differentiation and function. Annu Rev Immunol 2012; 30:531–564. Cines DB, Bussel JB, Liebman HA, Luning Prak ET. The ITP syndrome: pathogenic and clinical diversity. Blood. 2009; 113:6511–6521. Culic S, Labar B, Marusic A, Salamunic I. Correlations among age, cytokines, lymphocyte subtypes, and platelet counts in autoimmune thrombocytopenic purpura. Pediatr Blood Cancer 2006; 47(Suppl):671–674. Kuwana M, Kaburaki J, Kitasato H. Immunodominant epitopes on glycoprotein IIb-IIIa recognized by autoreactive T cells in patients with immune thrombocytopenic purpura. Blood 2001; 98:130–139. Olsson B, Andersson PO, Jerna M. T-cell-mediated cytotoxicity toward platelets in chronic idiopathic thrombocytopenic purpura. Nat Med 2003; 9:1123–1124. Coopamah MD, Garvey MB, Freedman J, Semple JW. Cellular immune mechanisms in autoimmune thrombocytopenic purpura: an update. Transfus Med Rev 2003; 17:69–80. Wing K, Sakaguchi S. Regulatory T cells exert checks and balancesn on self tolerance and autoimmunity. Nat Immunol 2010; 11:7–13. Sakaguchi S. Naturally arising Foxp3-expressing CD25+CD4+regulatory T cells in immunological tolerance to self and non-self. Nat Immunol 2005; 6:345–352. Mottet C, Golshayan D. CD4+CD25+Foxp3+ regulatory T cells: from basic research to potential therapeutic use. Swiss Med Wkly 2007; 137:625–634. Karakantza M, Theodorou GL, Zoumbos NC. Adult chronic idiopathic thrombocytopenic purpura (ITP) is the manifestation of a type-1 polarized immune response. Blood 2004; 103:2645–2647. Catani L, Sollazzo D, Trabanelli S, Curti A, Evangelisti C, Polverelli N. Decreased expression of indoleamine 2, 3-dioxygenase 1 in dendritic cells contributes to impaired regulatory T cell development in immune thrombocytopenia. Ann Hematol 2013; 92:67–78. Fujio K, Okamura T, Yamamoto K. The family of IL-10-secreting CD4+ T cells. Adv Immunol 2010; 105:99–130. Bridoux F, Badou A, Saoudi A, Bernard I, Druet E, Pasquier R. Transforming growth factor beta (TGF-beta)-dependent inhibition of T helper cell 2 (Th2)-induced autoimmunity by self-major histocompatibility complex (MHC) class II-specific, regulatory CD4(+) T cell lines. J Exp Med 1997; 185:1769–1775. Ling Y, Cao X, Yu Z, Ruan C. Circulating dendritic cells subsets and CD4+Foxp3+ regulatory T cells in adult patients with chronic ITP before and after treatment with high-dose dexamethasome. Eur J Haematol 2007; 79:3106. Sakakura M, Wada H, Tawara I, Nobori T, Sugiyama T, Sagawa N, Shiku H. Reduced CD4+CD25+ T cells in patients with idiopathic thrombocytopenic purpura. Thromb Res 2007; 120:187–193. Less O. Immunophenotyping of blood cells: From removal to Cytome reading: the different methods. French Review of laboratories 1996; 287: 33–39. Fahim NM, Monir E. Functional role of CD4+CD25+ regulatory T cells and transforming growth factor-beta1 in childhood immune thrombocytopenic purpura. Egypt J Immunol 2006; 13:173–187. Zahran AM, Elsayh KI. CD4+CD25+ high Foxp3+ regulatory T cells, B lymphocytes, and T lymphocytes in patient with acute ITP in Assiut Children Hospital. Clin Appl Thromb Hemost 2014 20:61–67. Baraka A, Boria M, Hesham MA, Almalky MA. 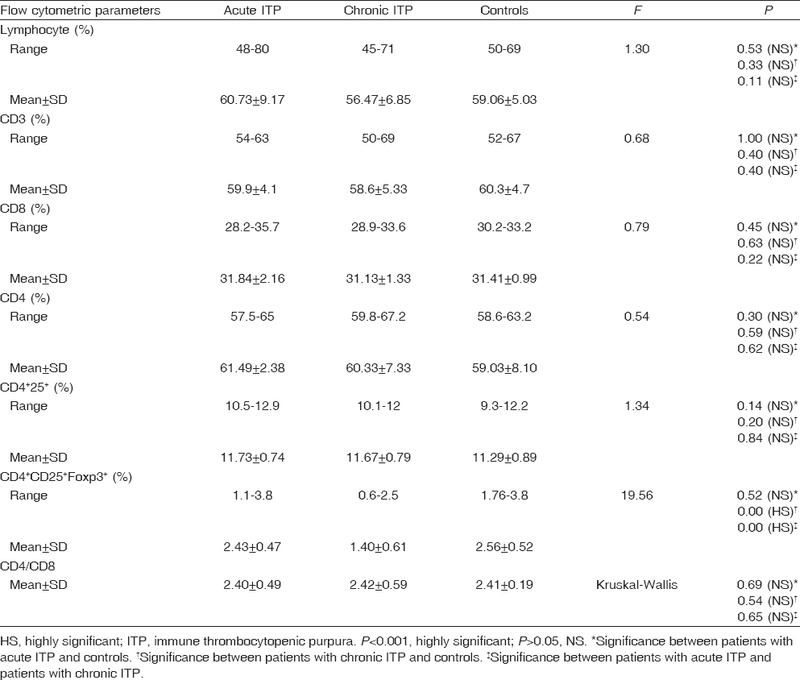 Study of T-regulatory cells in patients with acute, idiopathic thrombocytopenic purpura. Egypt J Haematol 2014; 39:2. Talaat RM, Elmaghraby AM, Barakat SS, El-Shahat M. Alterations in immune cell subsets and their cytokine secretion profile in childhood idiopathic thrombocytopenic purpura (ITP). Clin Exp Immunol 2014; 176:291–300. Edslev PW, Rosthoj S, Treutiger I, Rajantie J, Zeller B, Jonsson OG, NOPHO ITP Working Group. A clinical score predicting abrief and uneventful course of newly diagnosed idiopathic thrombocytopenic purpura in children. Br J Haematol 2007; 138:513–516. Mazzucco KL, Junior LM, Lemos NE, Wieck A, Pezzi A, Laureano AM, et al. Assessment of regulatory T cells in childhood immune thrombocytopenic purpura. ISRN Hematol 2013; 2013:143687.